At the end of September, in association with the “Association for Blind and Poor Vision People” in Jevrejska 24 street in Belgrade, the company Pharma Maac maintained education, training and donation of blood glucose meters with speech function. In 3 days 45 patients were present (those who hava lost their vision due to advanced disease). All patients were separately trained to use the device properly and explained where they could in the future be able to raise their own therapy. Patients have expressed their enthusiasm because “someone payed attention on them”, as they said. 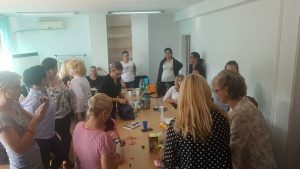 We will try to keep this type of workshops and donations in as many cities in Serbia as it is possible, because it is essential for us to improve the quality of life for patients with special needs. Our biggest reward is satisfied customer!